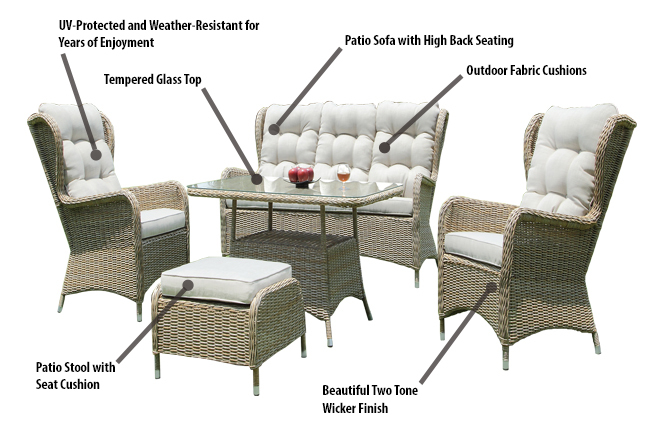 The Charleston Way Outdoor Wicker Patio Sofa Set by Factory Buys Direct features luxurious synthetic two-tone wicker, plush seat cushions and high back seating. The modular seating design lets you customize your outdoor oasis to fit your space. Features durable all weather wicker and aluminum frames for durability. The chairs are completed with a weather and UV-resistant seat cushions using quality fabric and foam. Perfect for any decor, a great choice for either indoor or outdoor use.